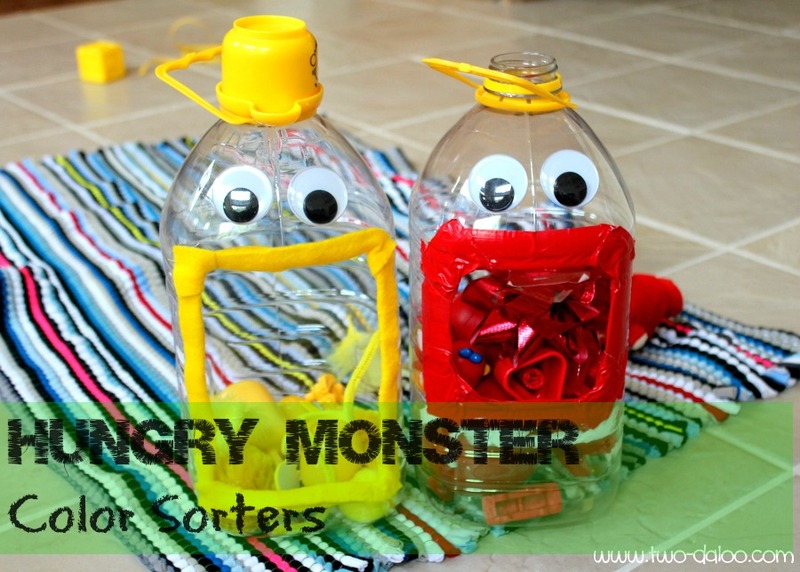 These Hungry Monster Color Sorters are just one of the many creative and fun color activities for toddlers featured by Twodaloo in her post of 30 Colorful Activities for Toddlers. I will certainly be revisiting the post and doing many of these activities with Wild Thing and Caterpillar. Her post also jumped out at me because in some end of year clearing out and clean up of photos, I came across a fun color activity Wild Thing did last year. 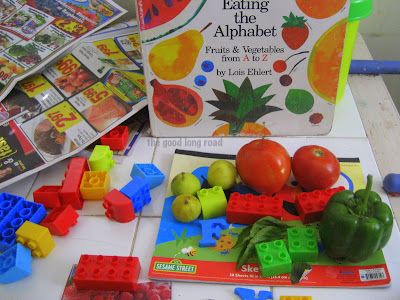 I absolutely loved this unstructured activity and how he decided to utilize the items laid out on our table that day (as well as some produce items from the kitchen)! 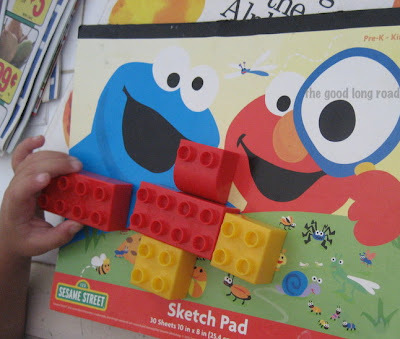 It began with blocks on his sketch pad, but quickly evolved to include many other elements on the kitchen table and in the kitchen as the activity expanded as he sought to engage more and more elements surrounding him, resulting in what I thought was a pretty cool color matching activity. We had been reading Eating the Alphabet, so I think he decided it was natural to include some produce items. 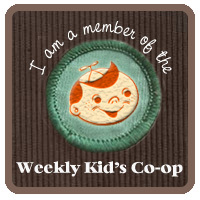 He also picked out some produce pictures from the weekly grocery store ads for me to cut out for him to match with his block as well. Plus, we got some early literacy in there too with the letter magnets from the fridge. He always remembers from the book that F is for Fig, so there is our F right below the figs. What a cool spontaneous activity! I love that he included produce from the kitchen! Cool activity! Way to work in learning of a bunch of different things all at once!